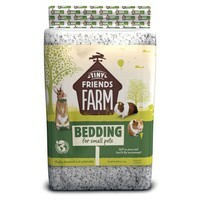 Supreme Tiny Friends Farm Bedding for Small Pets is an eco-friendly and sustainable bedding ethically sourced and manufactured in Great Britain. Made from surplus paper that would otherwise have gone into landfill, the bedding is long lasting, highly absorbent of both moisture and odours, and virtually dust free. It is also extremely soft on your tiny friends’ paws and kind to the environment. Fully compostable with recyclable packaging, Tiny Friends Farm Bedding is suitable for rabbits, guinea pigs, chinchillas, degus, hamsters, gerbils, rats, mice and ferrets.